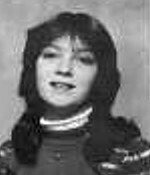 The 1984 missing person case of Shirley Ann "Tippy" McBride. Shirley Ann McBride who was known to her friends as "Tippy," was last seen in Concord, NH on July 13, 1984 leaving her sister's apartment on Union Street. Shirley Ann was fifteen years old at the time of her disappearance. Shirley Ann has not been seen nor heard from since. She was wearing light summer clothing at the time of her disappearance. She left behind money, clothing, and other personal effects. Although this case has not been ruled a homicide, the circumstances surrounding her disappearance would suggest foul play was involved.